Guinea pigs are small members of the rodent family native to South America, but they have been domesticated for several hundred years. They were popular lap pets in European courts, and their names have become synonymous with "test subject." Many people find them to be an excellent pet for a home or apartment. A guinea pig is often thought of as a good pet for children, and this is true, but as with all pets, parents must make certain the child is old enough to be gentle with the animal and mature enough to care for it properly. They are sociable animals and need homes where they will receive attention and affection. Being left in a cage and ignored is a harsh life for the animal since they are affectionate and love to be held. Owners should be prepared for this. 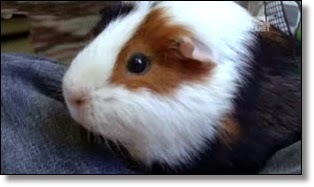 A prospective owner should get a good book on guinea pig care and read it carefully. The animal's needs are not elaborate, but at the most basic, one needs a roomy cage, safe bedding, a ceramic food bowl, a water bottle with a sipper spout, pellets, and timothy hay. Some people put a little plastic or wooden shelter inside the cage, but this is not recommended for the first week or so at home. The rodent may retreat inside the shelter and refuse to come out, except to eat. A shelter should only be added after the pet has become accustomed to its environment. Guinea pigs are strict vegans: they do not eat any kind of meat product and do not need dairy products or sweets. A nugget of corn or wheat cereal once in a while may be a nice treat, but these should not be given regularly. Pellets formulated especially for these animals should compose the bulk of the diet, along with timothy hay. Some cages have ricks where hay can be placed for eating at leisure, but most piggies do not nibble throughout the day &mdsah; they will eat an entire rick-full and "week" for more. Incidentally, the “wheek!” is a noise that the animal does not make in the wild. It is a call reserved for humans opening the refrigerator, and the animal knows exactly what is in there: treats. Within their limits, these rodents are fairly bright. They know what the refrigerator is for, or at least that opening the door means a treat might be in their future. Pets seem to respond to their owners coming in from being absent, and they certainly relish being picked up and loved. They return affection with nuzzles, head butts and gurgles of contentment. The guinea pig is a prey creature, and so will mask illness. An owner should look for any nasal discharge or diarrhea and notice if the animal is not drinking water. These are sure signs of illness, and time is always of the essence when treating this rodent. If possible, the animal should be taken to a veterinarian specializing in exotic pets for treatment. The animal’s cage should be kept out of direct sunlight and drafts. The room temperature should be fairly consistent to help keep illness away. Loud noises should be kept to a minimum, when possible. One great advantage of the guinea pig as a pet is that it is quiet. It will wheek and squeak and gurgle, but not loudly. They rattle their water bottles and bang items around in their cages, but do not create much commotion. When their cages are kept clean, these pets also have very little odor. People are rarely allergic to them, which makes them good pets for those who love animals but can't have a cat or dog. Most are also generally fastidious little animals and keep themselves groomed, although gentle brushing with a soft-bristled brush is also appreciated. Guinea pigs are often packed with personality and friendliness. They rarely bite and are sociable, likable little animals. As such, they can make excellent pets. Think You Know America's No. 1 Pet? Read On! Why Does Your Dog Yawn?